It isn’t often that I do iPhone application reviews, but this outstanding game forces me to make an exception, even though it means adding to the numerous raving reviews already on the web. The game features 3 gameplay modes – a month long campaign, an endless siege mode and a sandbox mode for you to experiment with the various ways of slaying the undead. The campaign offers 31 missions (presented as days on a calendar), which includes one boss level. The difficulty level slowly increases during the campaign as you are introduced to more variants of zombies – there are a total of 6 species of zombies – and also more ways of killing them. Over all, the difficulty curve is pretty good – you might die a few times in the later levels (especially the last one), but not enough times to frustrate you so much that you quit the game. (I am talking about on normal difficulty, not the easy difficulty that was introduced during the Easter update). However, one bad thing is that the game is so addictive that I found 31 missions to be kind of lacking (I finished the game in about 4 hours or so) and while the hard mode has been unlocked for you, it feels kinda boring to replay everything on hard mode (though it’s more challenging – and thus more frustrating – and there are new items for you to unlock). Now, onto the gameplay itself. You start with the standard flick-the-zombie, as with all castle defense games. 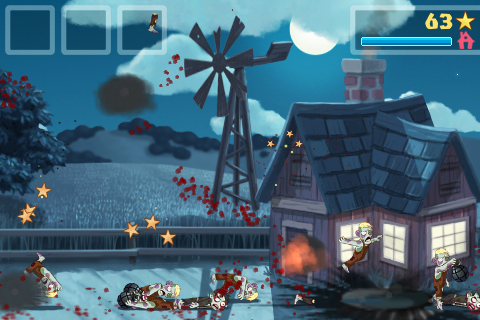 What differentiates ZombieSmash from the likes of StickWars [iTunes Link] is the ragdoll physics (there are a total of 6 parts to a zombie – all of which detachable). This becomes especially fun to watch when you smash the zombie to the ground (because sometimes flicking them simply does not kill those persistent bastards). And when the going gets tough, you can use special powers (which are upgradable using stars that you earn from killing zombies) to clear those pests. However, one of the flaws of the gameplay is that some of the special powers require too much user interaction – for example it’s quite hard to actually smash a grenade with one thumb while simultaneously flicking away zombies that have gotten too close for comfort. I have died many times trying to smash the liquid nitrogen canister on an incoming mob and failing to notice the singular zombie that have gotten past me. That being said, these special powers are a definitive part of the gameplay – nothing is more satisfying than watching a wrecking ball smash through the ranks of the undead. Oh, and did I mention that there is a killcam to show you exactly how you killed the last zombie in the mission? There’s an online leaderboard and social feature powered by Crystal. However, the some of the achievements – which can be earned by killing a zombie in a spectacular manner – can be easily accomplished by the sandbox mode. Maybe the developers should look into only allowing kills in the campaign mode and endless siege mode to qualify for the achievements. In conclusion, though the gameplay might be a little short and the control scheme unrefined in certain areas, ZombieSmash is definitely an original game that is well worth its price, especially given that it seems to be in active development.